Alarm 1a: Where And When The Terrorist Will Strike? 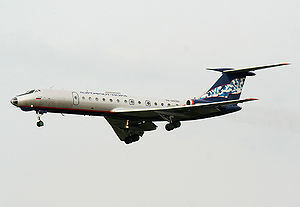 The Russian aircraft bombings of August 2004 were terrorist attacks on two domestic Russian passenger aircraft at around 23:00 on 24 August 2004. Both planes had flown out of Domodedovo International Airport in Moscow. A Tupolev Tu-134 similar to the aircraft destroyed. RA-85556's sister Siberia Airlines Tupolev Tu-154. Bold indicates incidents resulting in more than 50 deaths. Incidents are bombings unless described otherwise. 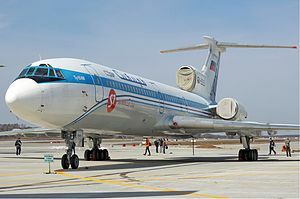 The first to crash was Volga-AviaExpress Flight 1353, a Tu-134 aircraft, registered RA-65080, which had been in service since 1977. The plane was flying from Moscow to Volgograd. It left Domodedovo International Airport at 22:30 on 24 August 2004. Communication with the plane was lost at 22:56 while it was flying over Tula Oblast, 180 km south-east of Moscow. The remains of the aircraft were found on the ground several hours later. Witnesses on the ground said that they saw a strong explosion on the plane before it crashed. 34 passengers and 9 crew members were on board the plane. All of them died in the crash. Just minutes after the first crash, Siberia Airlines Flight 1047, which had left Domodedovo International Airport at 21:35 on 24 August 2004, disappeared from the radar screens and crashed. The Tu-154 aircraft, registered RA-85556, which had been in service since 1982, was flying from Moscow to Sochi. According to an unnamed government source of the Russian news agency Interfax, the plane had broadcast a hijack warning while flying over Rostov Oblast at 22:59. The plane disappeared from radar screens shortly after that and crashed. 38 passengers and 8 crew members were on board the plane, and there were no survivors after the crash. The debris of the aircraft was found on the morning of 25 August 2004 9 km from village Glubokoye, Rostov Oblast in Kamensk-Shakhtinsky Raion. On 24 August 2004, the bombers were stopped in the airport by the police captain Mikhail Artamonov to be searched for weapons and for identification. They were accompanied by two male Chechens, the four of them arrived to Moscow on a flight from Makhachkala. According to the prosecution, Artamonov let them go without doing the search, and subsequently was charged with criminal negligence. The prosecution asked the judge to give him six years of imprisonment. On 30 June 2005, he was convicted of negligence and sentenced to seven years of imprisonment. That sentence was appealed, and the court reduced the term of his imprisonment from seven to six years. According to investigators, ticket seller Armen Aratyunyan was bribed approximately �140 (US$170) to sell tickets to the two women without getting proper IDs. Aratyunyan also helped Dzhebirkhanova to bribe the ticket-checking clerk, Nikolai Korenkov, with �25 (US$30) to get on board without a proper ID. On 15 April 2005, Aratyunyan and Korenkov were convicted of giving and taking the bribe, respectively. Because of serious consequences of the bribe, they were sentenced to 1.5 years in settlement colony each (settlement colony convicts have more rights and privileges than people in regular colony). Twenty-one relatives of the deceased passengers filled a civil suit against the security company responsible for checking the passengers, ZAO East-Line Aviation Security. They demanded 3,000,000 rubles (approximately �86,600 or US$115,000) in damages per victim. The trial in that case started in Volgograd on 22 February 2007. The security company claimed that it was not liable for damages, but the persons who organized the bombings were. The court handling the civil case sent a request to the prosecutor's office to get an update on the criminal investigation. It turned out that the investigation was suspended indefinitely on 26 September 2006. According to the investigator who was handling the case, the people helping the suicide bombers at the airport were killed in Chechnya, the people responsible for planning the bombings were not identified (Shamil Basayev, who claimed responsibility for organizing the bombings, was killed as well), so the investigation was suspended due to lack of suspects. That civil case was still in court as of December 2009. Other passengers' relatives also sued the Russian Ministry of Internal Affairs, S7 Airlines and two insurance companies, Ingosstrakh and OAO Afes for damages (none of the defendants acknowledge any liability). On 21 October 2007, court in the latter case found S7 Airlines liable for damages and ruled they should pay the relative of the victim in question 250,000 rubles (approximately �7,000), which was about 10% of what the plaintiffs asked for. S7's initial appeal was rejected by the court on 27 May 2008. A new S7 appeal was successful in April 2009 and the verdict was thrown out. This time, relatives of the passenger appealed that decision, but their appeal was dismissed in August 2009. Then they planned to appeal to a higher court. ^ Jump up to: a b Kurz, Robert W.; Charles K. Bartles (2007). "Chechen suicide bombers" (PDF). Journal of Slavic Military Studies (Routledge) 20: 529?547. doi:10.1080/13518040701703070. Retrieved 30 August 2012. ^ Jump up to: a b "Bomb traces in both Russian jets". BBC. 29 August 2004. Retrieved 31 August 2012. Jump up ^ "Russia plane crashes caused by explosives". Associated Press. 30 August 2004. Retrieved 3 June 2009. ^ Jump up to: a b Dougherty, Jill. "Chechen 'claims Beslan attack'." CNN. Friday 17 September 2004. Retrieved on 31 October 2011. Jump up ^ Мособлсуд снизил наказание капитану милиции, осужденному за халатность, повлекшую взрывы самолетов (in Russian). NEWSru.com. 26 January 2006. Retrieved 3 June 2009. Jump up ^ В Волгограде началось рассмотрение иска родственников погибших пассажиров Ту-154, взорванного в 2004 году (in Russian). NEWSru.com. 22 February 2007. Retrieved 3 June 2009. Jump up ^ Генпрокуратура прекратила дело о взрывах самолетов, летевших из Москвы в Волгоград и Сочи (in Russian). NEWSru.com. 27 April 2007. Retrieved 3 June 2009. Jump up ^ Родственники погибшего при взрыве самолета в 2004 году подали в суд на МВД РФ (in Russian). NEWSru.com. 17 July 2007. Retrieved 3 June 2009. Jump up ^ Voronov, Konstantin (22 October 2007). "Суд дал оценку жизни пассажира // Вынесено решение по иску к авиакомпании S7" (in Russian). Kommersant. Retrieved 3 June 2009. Jump up ^ Voronov, Konstantin (28 May 2008). "Авиаперевозчика обязали заплатить за теракт // S7 Airlines оказалась в долгу перед погибшими пассажирами" (in Russian). Kommersant. Retrieved 3 June 2009. (Russian) Report. Interstate Aviation Committee. This page was last modified on 1 March 2015, at 11:41.